Like to know more about B2? 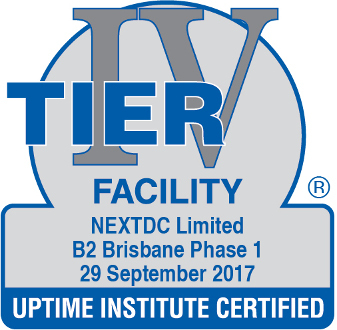 Brisbane's only Uptime Institute Tier IV colocation facility, delivering your business 100% uptime. To support your power and high-density computing requirements. Showcasing the latest technology innovations in data centre design, B2 is the new industry benchmark for security, performance, reliability and energy-efficiency, setting a new standard of what customers expect from their data centre. 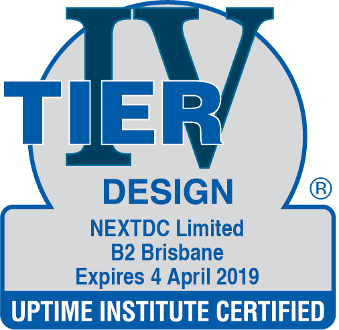 With NEXTDC's footprint growing across Brisbane, our customers have the flexibility to connect directly between B1 and B2, via Data Centre Interconnect (DCI), providing a seamless extension between data centre infrastructure and IT services spread across both facilities. Read about how our Tier IV facilities can optimise your business through complete fault tolerance and 100% guaranteed uptime. 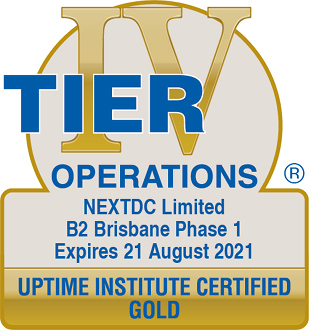 B2 was Australia's first data centre to achieve Uptime Institute Tier IV Certification for Design Documents and Constructed Facility as well as Tier IV Gold Certification for Operational Sustainability. Showcasing complete fault tolerance and 100% uptime, B2 has been constructed to withstand individual equipment failures or distribution path interruptions and maintain IT operations.